Are you here looking for info on how to do Sanford Bennett’s face exercises? Good, because that’s what you’re going to find in this article. I felt the need to put this guide together after trying to find the very same information on the internet. However, the only things that came up were websites where people have created their own facial exercises “inspired by” Sanford Bennett’s face exercises. Upon closer examination, these exercises bear no resemblance to the ones he wrote about in his two books, Exercising in bed (published in 1907) and Old age—its cause and prevention (published in 1912). I went on to read both of these books which were fascinating but also a bit hard to follow. Especially the second book which felt like wandering around in a maze. The exercises are not grouped together and the pictures are not near the explanations. Not only that, a lot of the information is repetitive. So I’ve done my best to decode these facial exercises by grouping the explanations and pictures together. Some of the explanations are verbatim and others are summarized. They will be in order starting from the top of the face and working down to the neck. I have also added my own comments and suggestions as needed. 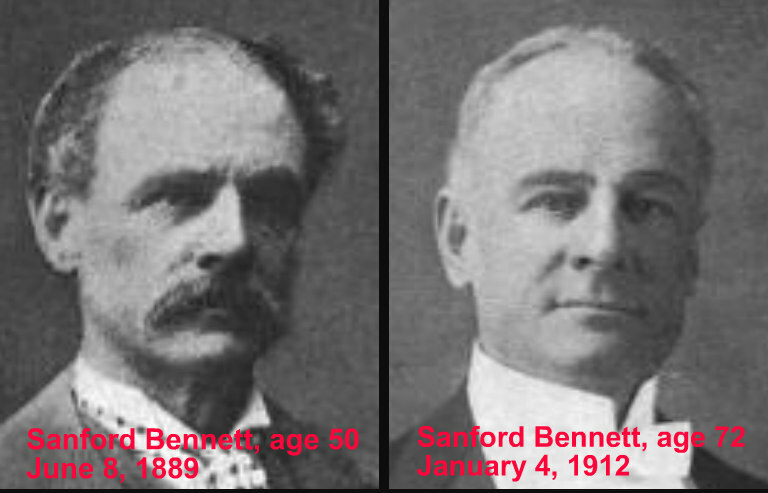 Sanford Bennett (1841 to 1926) called himself “the man who grew young at seventy” and his before and after pictures seem to back that up. I believe he was a visionary and I encourage you to learn more about him by reading his books (linked at the end of this article). 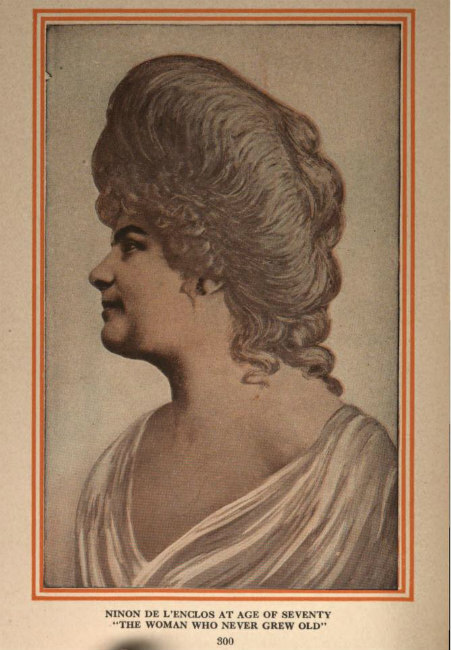 He developed his face exercises based on a pamphlet that was used by Ninon de L’Enclos (1620 to 1705). She was known as the woman who never grew old. Here’s her portrait at age 70. 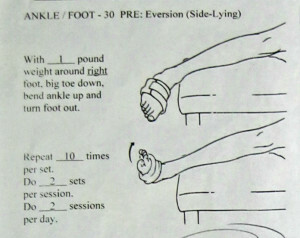 All these exercises are meant to be done lying down. Don’t be too vigorous with friction and massage because you might chafe the skin and/or make the muscles sore. Two methods for facial rejuvenation are discussed: facial massage and rubbing out wrinkles. I believe the facial massage is meant to be done dry, while rubbing out wrinkles is meant to be done using a little oil or skin cream for lubrication. Therefore I think it makes more sense to do the facial massage first, followed by rubbing out wrinkles. The exercises should be performed once a day. Bennett said his full body and face exercise routine took about an hour. Just doing the face exercises should take a lot less time. The skin, like any piece of leather, is improved by friction using dry palms and fingers. It will remove fine lines and wrinkles. You may temporarily create new lines because vigorous massage may rapidly remove underlying fat deposits. New fat will form again quickly and the face will resume its former condition with some slight improvement also. Facial massage is performed by contracting the muscles while massaging with the hands in place on the skin. 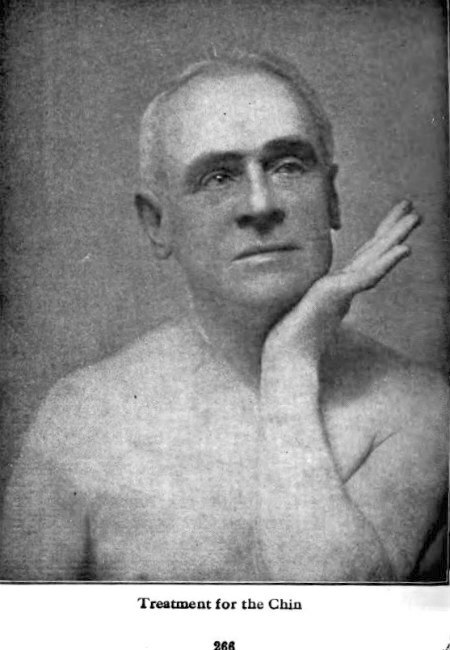 Bennett also claims that friction with dry palms and fingers will whiten the throat and brighten the sides and bridge of the nose. 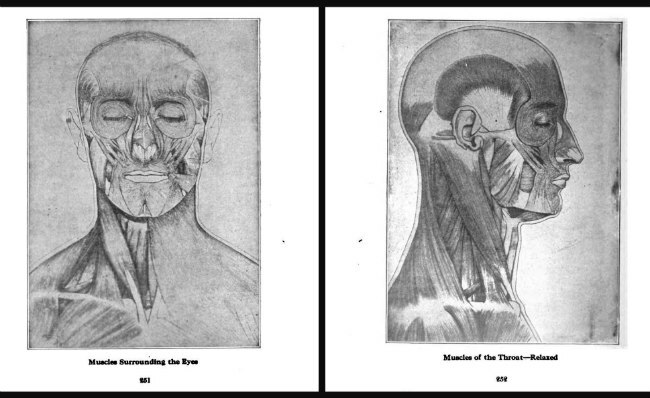 Here are diagrams of the facial muscles that will be worked. 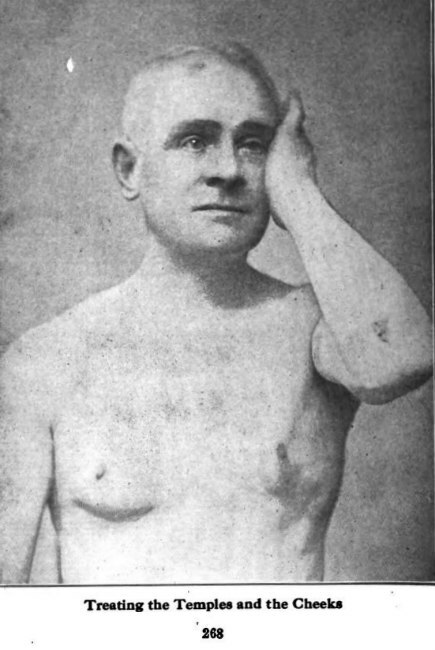 Firm rubbing of the temple muscles with the palm of the hand will develop the sunken muscles. Frequent friction towards the corner of the eyes will smooth the temples and remove crows feet. Do this for several minutes. Alternate this process by striking rapidly with the tips of the fingers. This percussion action carries blood to the part being treated and will help promote the growth of tissue. In time the shrunken muscles will be increased, even to the plumpness of youth, and the crows feet will disappear. 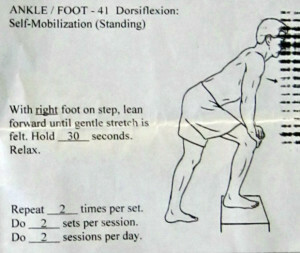 The first book contained two cheek exercises. 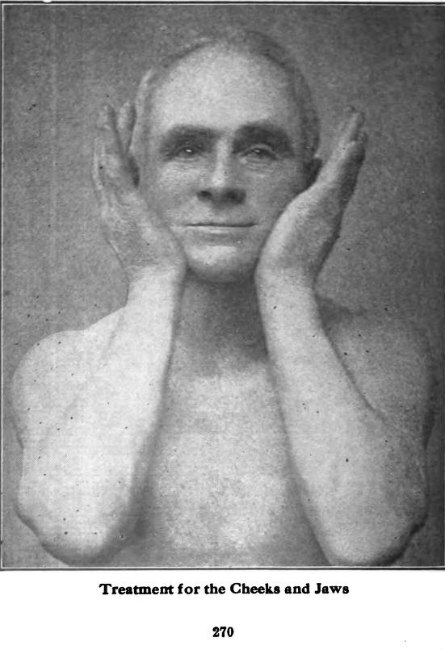 During the five years between the first and second book, Bennett devised simpler and more effective cheek exercises. Those are the ones I’m presenting here. If you would like to read about the original cheek exercises, please refer to page 217 of Exercising in bed (linked at the end). Contract or bunch up the cheek muscles. Press your palm firmly on the cheek and rub firmly, deliberately and well towards the temples or corners of the eyes. Start with 10 to 15 movements and increase as you see fit. You can do one side at a time or both sides at once. This exercise strengthens the large circular muscle around the eye and will prevent sagginess. It will also develop the cheek muscles which will make the hollows disappear. Draw up both corners of the mouth in the position of an exaggerated smile. This will bunch up the supporting muscles on the upper part of the cheekbones immediately below the corners of the eyes. Now drop the chin to its utmost extent. This will place further tension on the cheek supporting muscles. 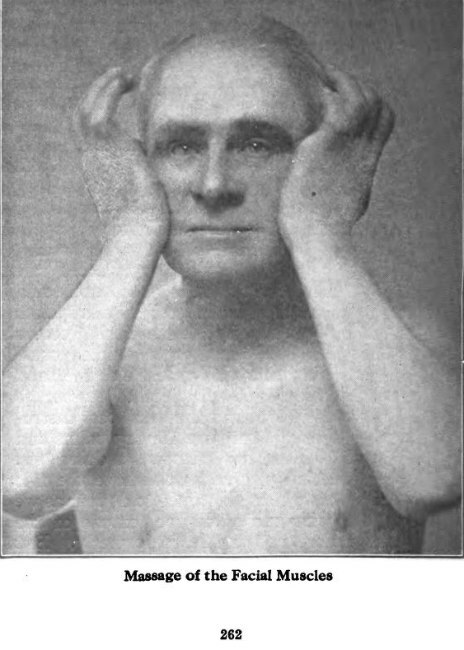 In this position, open and close the jaws and steadily rub with the palms of the hands. This will enlarge the muscles, giving support to the overlying skin and tissue which will give the cheeks the rounded appearance of youth. Over time there will also be an increase in color and a more youthful appearance. No further instructions were given so I’m suggesting opening and closing the jaws 10 to 15 times. This works the circular muscle surrounding the mouth to prevent or correct drooping and sagging. Insert your little fingers into your mouth and alternately pull and relax. 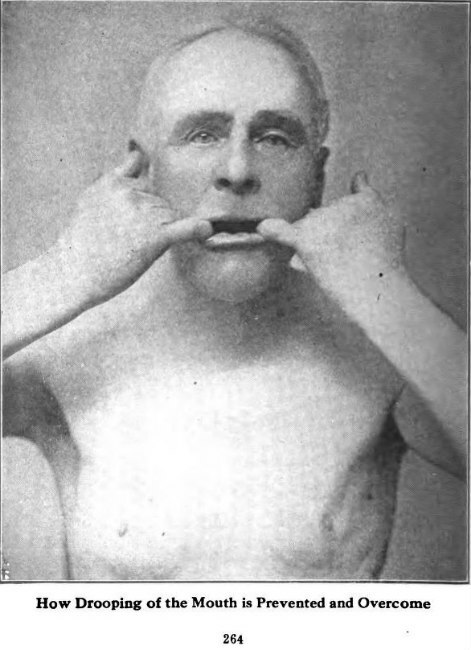 While not stated, the mouth should be tensed during the exercise. Duration is not specified so I’m assuming you start with 10 to 15 reps and work up as you see fit. Rest the chin on the palm of your hands and contract the muscles (set the teeth firmly). Press firmly and rub the underlying muscles vigorously. This is the same method described for the muscles surrounding the eye but requiring more pressure. The position of the hands should be continually shifted for the most rapid muscle growth. Duration is not specified so I’m suggesting remaining in each position for about 10 seconds. Deep massage with the heel of the hands along the edge of the jawbone (with the teeth firmly set) will result in a rounder, more youthful appearance. No further instructions are given but I think it’s implied that your hands should be repositioned until the entire jawbone is massaged. 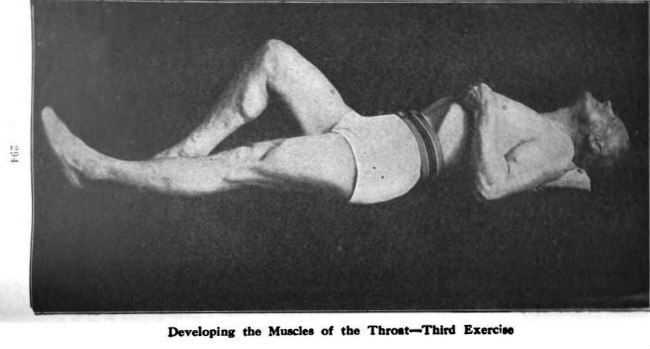 Three exercises are shown for the throat/neck area. Lie on your side with your head on a pillow. Place your thumb on the throat under the chin (or at about the center of the muscle which extends from the adam’s apple to the chin). If you lie on your right side, use your right thumb, and vice versa. 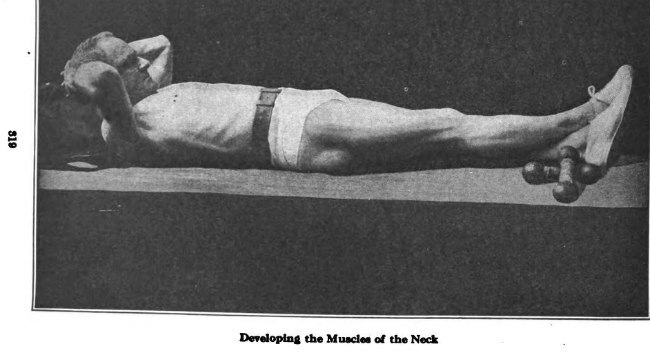 Bring the head forward, chin to chest, then back again, while keeping pressure with the thumb. Start with 10 reps and work up to 50. Lie on your side with your head on a pillow. Turn the chin as far as possible toward the upper shoulder. This will contract the sides of the neck. Drop your head back on the pillow and relax. Start with 5 reps and work up to 50 or more. Lie on your back with a pillow under the shoulders for greater stretch. Throw the head back as far as possible and bring it forward toward the chest. Begin with 5 reps and work up to 100. Helps to reduce a double chin and is also good for the abdominals. For developing and strengthening the neck, lie on your back with a pillow under your head. Clasp the back of your head with your hands. Raise your head off the pillow then press it backwards while using resistance from your arms. Start with 5 reps and work up to 25. In commencing the friction treatment and to keep the skin in place while you rub, stretch the skin with the first and second fingers of one hand and rub with the other, or the palm of the hand. The points needing the most attention will be the corners of the eyes, mouth, temples and immediately in front of the ears. To prevent chafing some lubricant (oil or face cream) must be applied at the points you’re rubbing. To tighten wrinkles, after using friction, spread raw egg white over the wrinkles with a shaving brush. Let sit to dry for five minutes. As it dries, the skin tightens up. Rinse off with pure, warm water. Egg white is a powerful astringent that should remain on the skin for a short time as it may cause the skin to shrivel. Therefore, this method should be used with caution. The frequency for the egg white treatment is not stated so I’m suggesting it only be done once or twice a week. Afterwards wash the face with soap, dry off and apply a thin layer of vaseline. Rub in and wipe off the excess, which will leave the skin soft, smooth and not shiny. I believe this step is optional. I welcome your questions, comments and suggestions. I would love to hear about your experience with Sanford Bennett face exercises. Can I wear heels after a broken ankle? This was one of the questions on my mind during my broken ankle rehab after a trimalleolar fracture. Wanting to walk in high heels is not a matter of vanity. It’s the desire to be made whole again and is an important milestone on the path to full recovery. The answer to that question is yes. But it requires training, just like learning to walk again required training. Because the ankle will wobble and the foot will hurt from bearing weight at different angles. And you’re going to be limping again, not a cute look in high heels. A bit before the second anniversary of the accident that occurred in September 2015, I decided it was high time to get back into my heels. I had already gotten used to wearing stable shoes with higher heels such as my flat boots with 1 inch heels and my cowboy boots with 3 inch heels. But it’s a whole other thing trying to walk in skinny-heeled shoes that I wore prior to the accident. The first time I put them on I felt like I was teetering on top of a very tall ladder. Actual height: 3½ inches. Of course my right foot was fine but the left one was hanging on for dear life. Once again it was like my left foot was a separate entity from the rest of my body. So what did I do? I got out my secret weapon…the crutch that helped me learn to walk without limping. Yes friends, I was walking around the house using a crutch wearing high heels. But you know what, it worked! 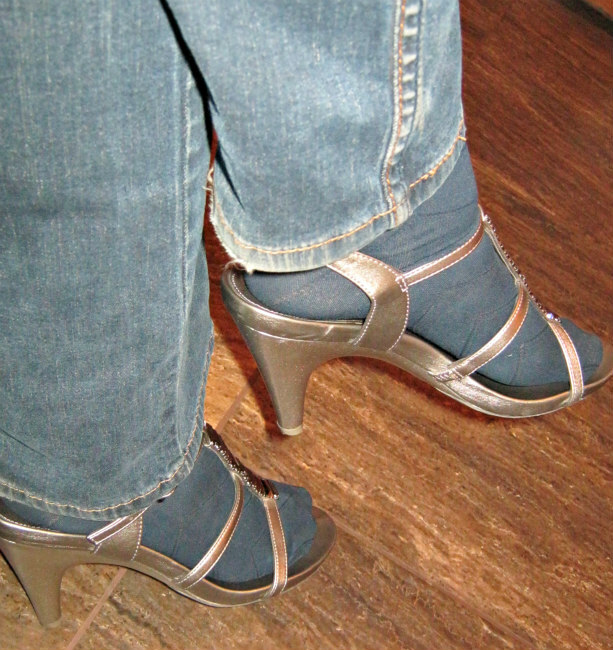 Soon the crutch was back in the closet and I was able to wear my tallest, skinniest pre-accident heels out in public. This triumphant moment happened on October 27, 2017! I decided to get rid of all my platform shoes. I love platform shoes and I had some really cute ones but I’ve always known they were unstable. They rock and it’s easy to fall off of them (hence, the broken ankle). I even got rid of my wedge shoes because that solid bottom sole also feels a bit unstable compared to shoes with a separate heel and more flexible sole. 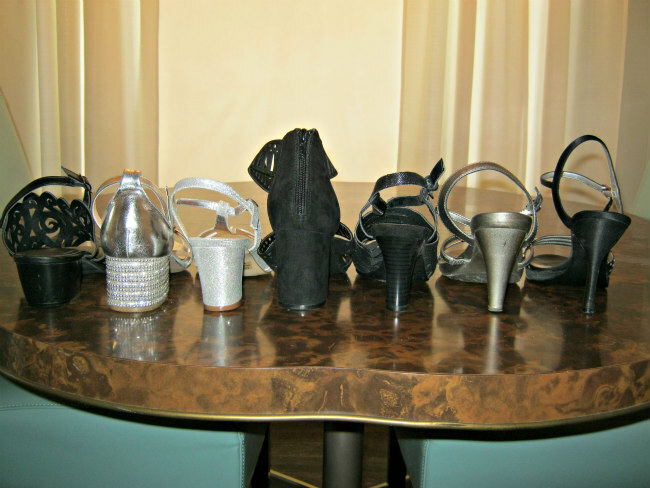 That left me with a few slides and sandals of varying heights and heel widths. I got a few pairs of block-heeled and chunkier-heeled shoes. Fortunately, they’re in style once more but I’ve always thought they were cute. I recommend getting shoes with varying heel heights (1½, 2, 2½, 3, 3½ inches). My maximum is 3½ inches. Training involves working your way up from the lowest to the highest, and from chunky to skinny heels. Stability and proper fit are important. Pumps, boots and shoes with straps are the most stable. Make sure the soles aren’t slippery. If they are, scuff them up with a little sandpaper because the last thing we want is to fall again. Begin high heel training with the shortest, chunkiest heels and progress to the skinniest, tallest ones. Slip on a pair and spend some time just sitting with them on, about ten minutes or so. Then stand up in them. That’s not going to feel too great but you need to get used to them gradually. Take a few steps if you can. Stop and try it again the next day but increase the walking time. My house has carpet and tile, and I worked up to taking a few laps around the house, getting used to walking on different surfaces. I would try to go ten laps. Before beginning high heel training, you should already be walking limp-free. 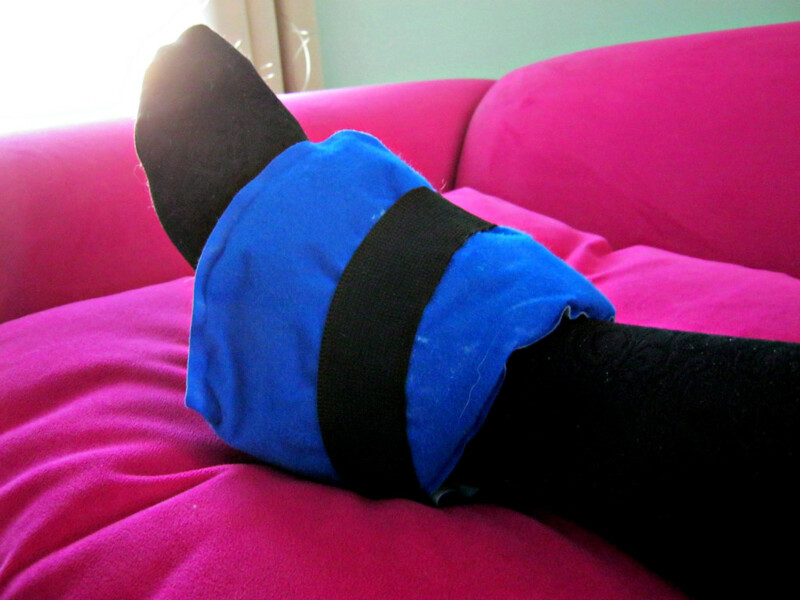 If not, you can refer to these articles for tips on walking without a limp: Broken ankle recovery and Magic shoes. I can’t emphasize enough the importance of walking correctly. As I said earlier, I needed to rely on a crutch while I was learning to walk properly in high heels. The crutch goes on your good side to support your bad foot during a step. The goal is to have a measured gait, taking the same amount of time with each step. When I mastered walking around the house properly without a crutch, I moved on to the next challenge, walking in the backyard. Now it’s time to strut your stuff outside. My backyard is mostly concrete and I would do about ten laps around the yard in my heels. I did this for a few days before I felt ready to move on to the next undertaking, going out in public. After you’ve got walking in the backyard down pat, it’s time to wear your high heels out in real life. Go on a short errand or over to a friend’s house, some place where there’s minimum walking. Bring a pair of flats or your magic shoes in case your feet poop out on you. Gradually you can go for longer trips, maybe even try a little dancing. 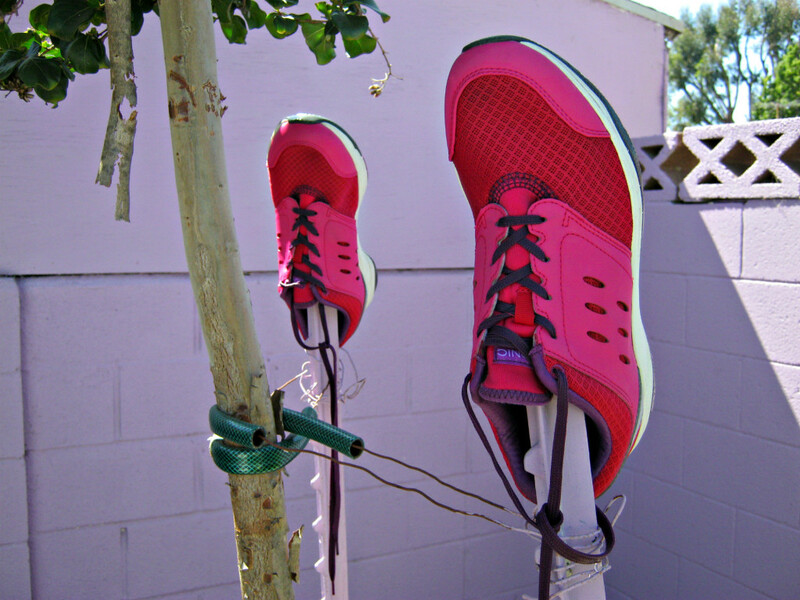 Keep backup shoes on hand until you no longer need them. Congratulations! You have now graduated to wearing high heels with confidence! When I became full weight bearing after broken ankle surgery, my physical therapist told me to get some orthopedic shoes with laces for good support. 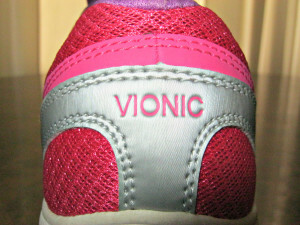 Not having anything like that I went online and found these amazing Vionic venture women’s mesh athletic shoes. 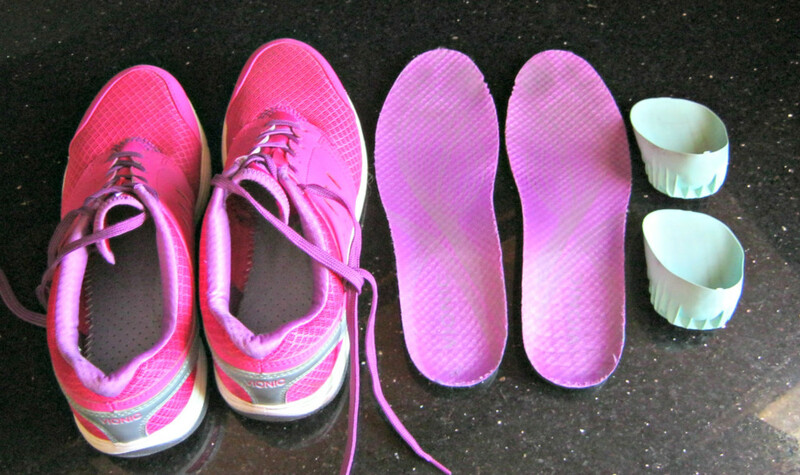 My left foot and ankle were in constant pain, especially the heel, and I felt I needed extra cushioning there so I paired them with Tuli’s heavy duty heel cups that I already owned from a prior bout with plantar fasciitis. 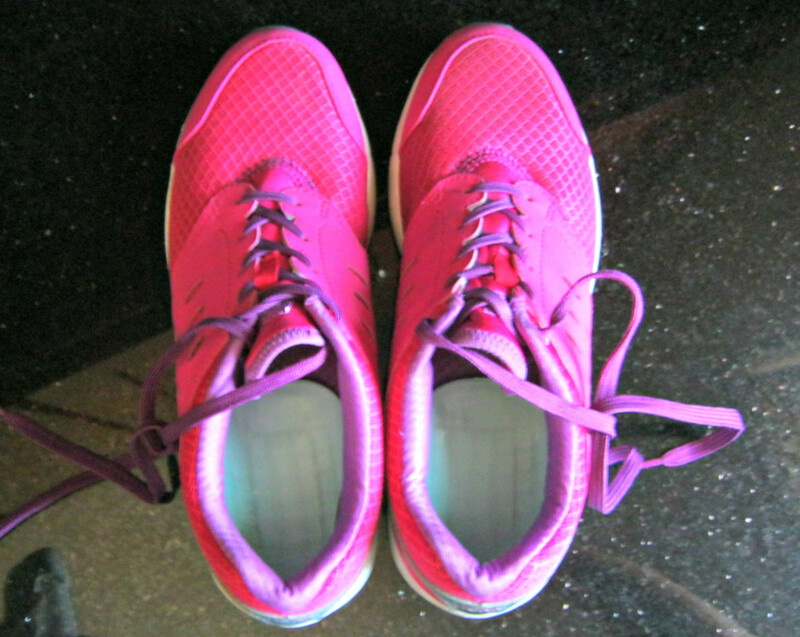 Together, these are my magic shoes which help me walk without limping and make it easier to do my ankle rehabilitation exercises. 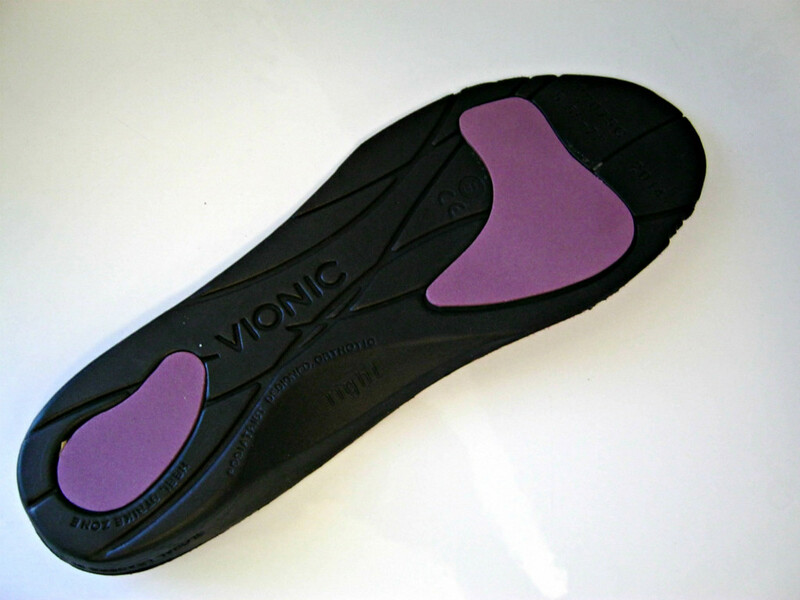 Here are more details on what to look for in an orthopedic shoe and why these Vionic shoes work well for me, as well as cleaning instructions to keep them looking like new. These shoes are made true to size with a little extra room in the toes. I ordered my correct size and there was still plenty of room for orthotics which I highly recommend to anyone with foot pain. 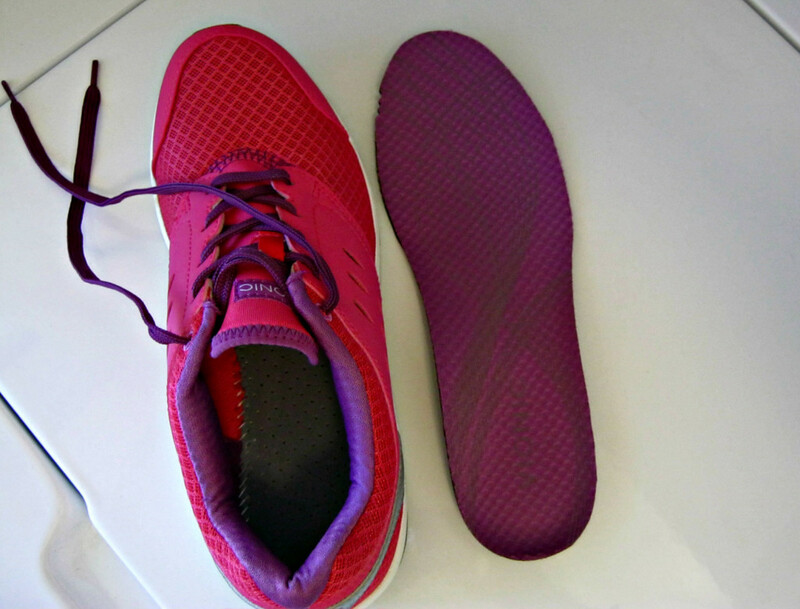 The sole is flexible, allowing the foot to bend properly while walking. 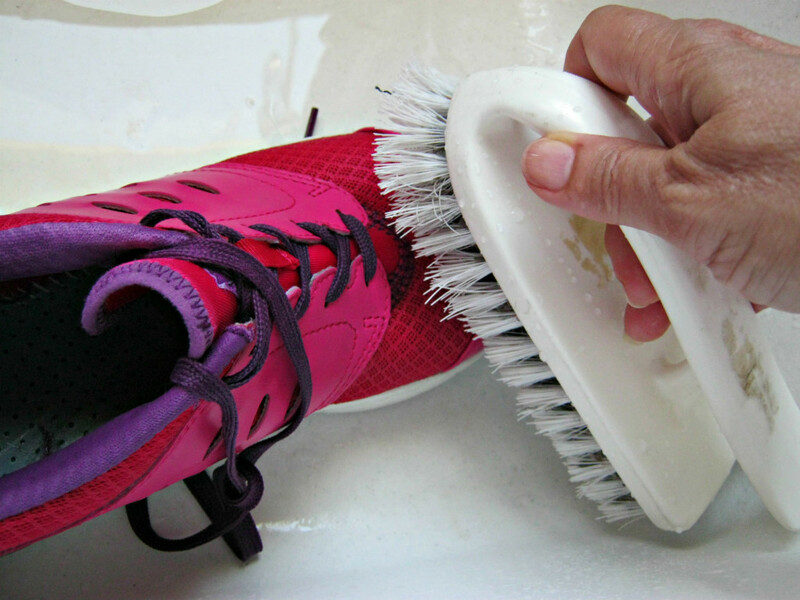 The footbed holds the foot in proper alignment and is removable for cleaning. Good support is crucial when learning to walk without limping because the foot is weak during the rehabilitation process. The footbed comes up higher on the side where the arch is and that’s where I feel it stabilizes my foot to keep me balanced through each step. 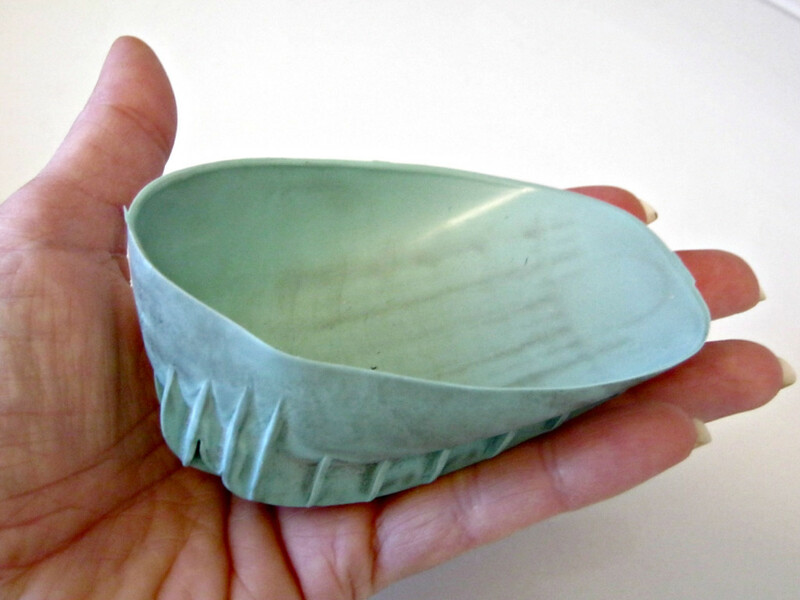 The shoe is cushioned lightly in the footbed and more heavily padded around the opening. It feels like a little pillow around my sore ankle. 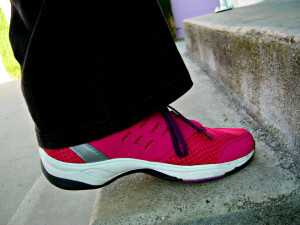 The stretchy mesh fabric keeps feet cooler and more comfortable. I also like that the tongue is sewn in place, making it a little easier to get on. The rubber soles have little ridges on the bottom for good traction. With the shoe being so lightweight and properly padded, I can wear them all day and practically forget I have them on. Finally, they’re just cute and the bright pink color I chose makes me happy! Instructions for this are lacking so I had to do some digging and learned that they can’t be washed in the washing machine or soaked in water. That presents a challenge when you end up with mud all over your shoes like I did one time. So what I did was to let the mud dry and then brush off as much as I could. Then I used an enzyme cleaner solution that I mixed from powder and placed in a spray bottle. 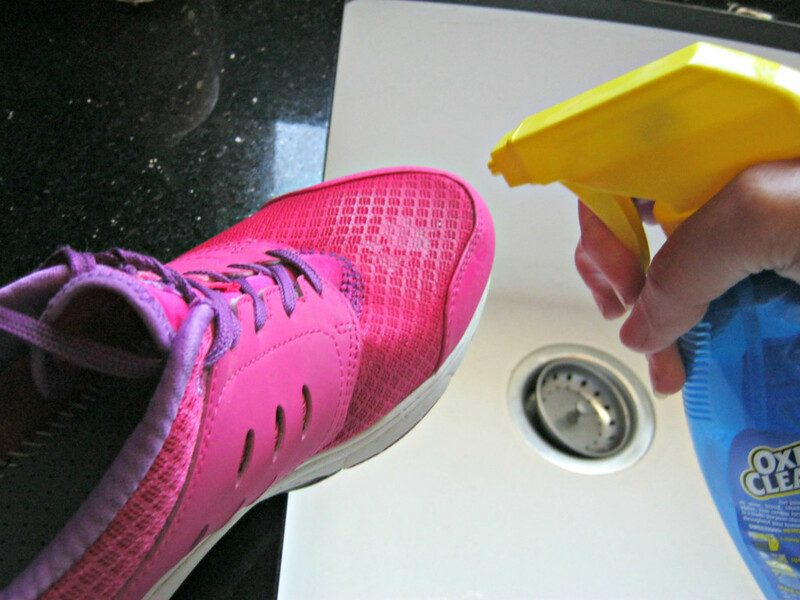 I saturated the shoes with the solution and let them sit in the sink for about 20 minutes. After that I scrubbed gently with a scrub brush, rinsed with water and put them in the sun to dry for a while. And voila, they look like new again. When I broke my ankle two months before my 60th birthday in 2015, my number one priority was getting back on my feet as soon as possible. I was going to do everything in my power to make that happen. I believe healing is very much a proactive thing that involves the body, mind and spirit. 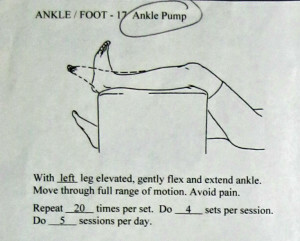 The details of my ankle rehabilitation continue below. For the backstory, click here. Following my trimalleolar fracture, I was told some dire things such as: the best outcome would be that I could walk again, it would take three to five months to be able to walk, I would be at risk for arthritis. To all this I replied no, I’m going to get back on my feet fast, I’m going to get all my function back and I’m not going to get arthritis. And that left them speechless. I did not, and still do not, accept any of that as my fate. This was merely information to use in designing my healing protocol. All good health begins with good nutrition (food and supplements) which is even more important when healing from an injury. The body is designed to heal itself but it needs the raw materials to do so. My normal diet consists of whole food that I cook myself, but after my accident I made sure to keep it super clean, eliminating sugar and alcohol because that inhibits healing. I mostly ate high-quality meat along with green vegetables, similar to a paleo diet. I already take a well-rounded array of supplements, but some new ones were added immediately following the accident. These are all the supplements I feel were the most necessary for healing bones, joints, veins and nerves (purchased from ProCapsLabs.com): ultimate calcium intensive care, glucosamine 1500 and chondroitin 1200, vitamin K2, B-12, marine collagen peptides, circulation and vein support. Many months after the accident I discovered turmeric-400, also from ProCapsLabs.com, which reduces inflammation, especially in joints. I notice the difference if I don’t take it, so I intend to continue taking it forever. A note about vitamins: not all vitamins are created equal. 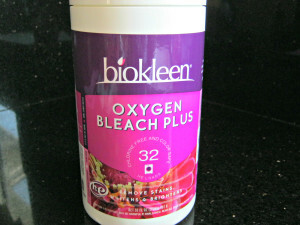 I recommend staying away from tablets and the stuff you find at big box stores and drug stores. This is going to sound a little woo-woo, but what you believe you manifest. Your brain pays attention to what you tell it. So you don’t want to say to yourself, I’m never going to walk, even though it may feel that way. When those negative thoughts creep in, it’s important to kick them out immediately. When I was still non weight bearing (NWB) and had to stand up using one leg, my leg got really tired from all the extra work. But when I would say “I’m strong,” it actually helped my leg to perform. And when I was full weight bearing (FWB) but still dependent on the walker, saying to myself “I’m well-abled” was prophesying my full restoration. I would also visualize walking on my own. I believe that helped me to walk just 20 days after becoming FWB. Another woo-woo thing to some is acupuncture. I decided to get five treatments when I was still struggling to walk, having had great success with it in the past. Even though I know it works, the way it works is a bit of a mystery. My general understanding is that it helps energy (chi) flow properly through the body. My energy flow was blocked from surgery and the subsequent scar tissue and swelling. Following each treatment I noticed a reduction in pain. Making myself more comfortable during recovery helped keep my spirits up (getting a knee scooter and a ramp). Finally, noticing and celebrating the small improvements every day gave me hope. Exercise is an important part of rehabilitating a broken ankle and I think it’s a good idea to start exercising as soon as possible. Here’s a breakdown of what I did from NWB to FWB. The first two weeks after surgery, I didn’t do anything other than wiggle my toes in the cast. 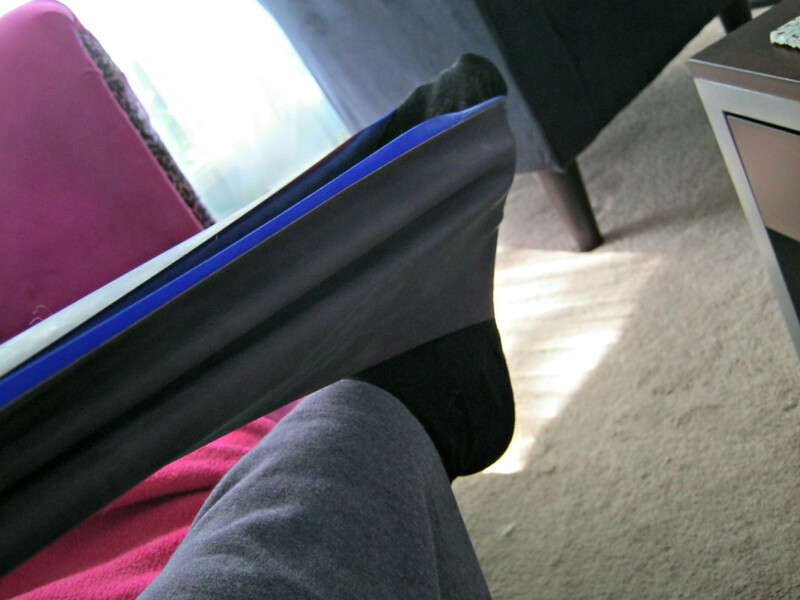 When the cast came off, I noticed that my calf was starting to shrink so I decided to do some exercises on my own. For the next six weeks I wore a boot and was still NWB. While wearing the boot, which weighed three pounds, I did leg lifts very slowly, 20 reps three times a day. I also did isometric exercises, tensing up the calf and thigh muscles a few times during the day. As a result, there was very little wasting of the calf when the boot came off. My leg still ended up getting weaker and I wish I had done more sessions throughout the day. Two weeks before being released by the doctor, I started physical therapy. Being NWB I was only allowed to do a few things which I did with the boot removed. Take advantage of physical therapy if it’s offered to you. I was allowed 21 sessions which I completed over the course of five months. Ankle pumps: while lying down with the leg elevated, slowly and gently bend foot forward, then straighten it out, stretching as much as possible without causing too much pain (20 reps, 4 sets, 5 times per day). 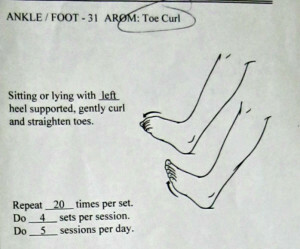 Toe curls: while still lying down curl toes down then flex them upwards (20 reps, 4 sets, 5 times per day). 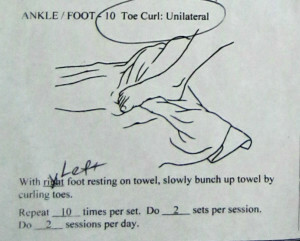 Toe flexion/extension: stabilize the heel with one hand, then with the other hand curl toes under and hold for 30 seconds. Then pull the toes up and hold for 30 seconds (2 reps, 1 set, twice per day). Marble pickup: place a bag of marbles on top of a towel, pick them up with the toes and put them in a bowl or move them from one side to the other (2 to 3 minutes, twice a day). Toe curls on towel: With a towel on the floor and the foot resting on top, curl the toes to gather up the towel (10 reps, 2 sets, twice per day). 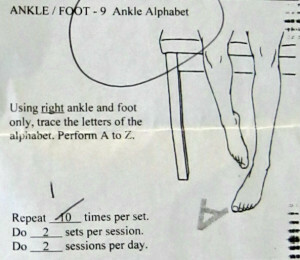 Ankle alphabet: while sitting or lying down, trace the letters of the alphabet using the foot and ankle only (1 rep, 2 sets, twice per day). Toe tapping: while sitting, tap foot gently on the floor (2 minutes, twice a day). Foot rocking: while sitting, very gently rock the foot backwards and forwards—toes down, then heel down (2 minutes, twice a day). My physical therapist told me it can take a year or longer to regain full range of motion. When I started going there, my dorsiflexion was -5 degrees. On my last session it was 13 degrees. There’s still a ways to go before the left foot catches up with the right one. Too little value is given to the power of rest, which goes beyond getting enough sleep. Exercise needs to be balanced with rest because that’s when the body heals itself. Exercise tears down muscle and rest builds it back up again. There have been times when I’ve pushed myself too hard with exercise and activity which only caused me injury, so now I’ve learned to pace myself. For example, I try not to be on my feet for more than an hour at a time which is then followed up with resting on the couch with my legs up for a while. As the day goes on, if I find my foot starting to feel more pain to the point that I want to start limping, that’s my cue to stop for the rest of the day and take it easy. Nobody can tell you how much you should or should not be doing. You’ll just have to figure that out by listening to your body. That’s the question you might be asking if you’re like me. My goal is to do the least amount of exercise possible and still be fit. And it turns out that less is more when it comes to working out. Those extreme Biggest Loser-style workouts are actually counterproductive. Short bursts of high intensity movement are much more effective. And when I learned that 12 minutes is all it takes when you’re doing that type of exercise, I was so intrigued I just had to try it. I bought PACE Express fully intending to return it within 30 days if I didn’t like it. But guess what, I didn’t return it because I love it and I think you will too. PACE Express is a six-week program of high intensity workouts that can be tailored to any fitness level. No special equipment is required. 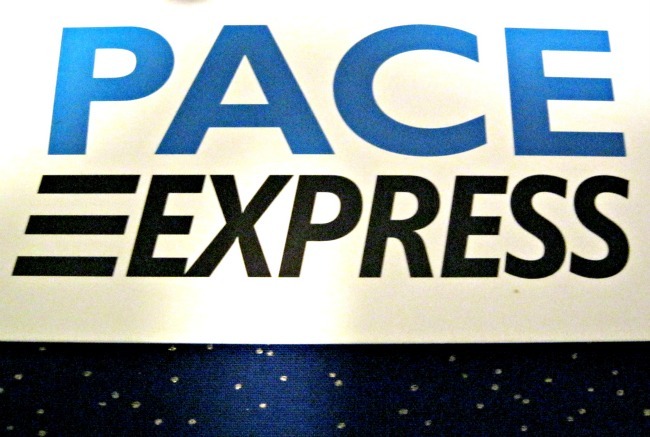 Read on to learn more about PACE Express and my review after using it for the last two months. I’m used to doing kettlebells several times a week and I consider myself to be in decent shape for someone approaching sixty. 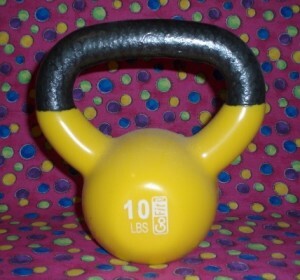 (While evaluating PACE Express, I only did one short kettlebell workout a week.) 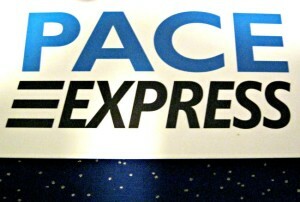 So I was pleasantly surprised that my muscles were a little sore, in a good way, after working out with PACE Express. Not only that, by the end of the six weeks my heartbeat recovery rate improved. I also feel that my lung capacity increased and that I have less stiffness in the lower back. Even though these are short workouts, they’re challenging. Afterwards, I’m a little tired, a little sweaty but very proud of myself for sticking with it. There’s a lot of variety. There are six DVDs, one for every week. Each DVD has six exercise routines which are different every day. You do one routine a day and on the seventh day you rest. Each 12 minute routine is broken down into three sessions that last four minutes apiece. There’s a two minute break in between sessions to take your pulse and let your heartbeat recover. A timer on the screen counts down the four minutes, and the instructor is really good about cuing for the next move. Every exercise is demonstrated for different fitness levels: low impact, standard and advanced. You can mix and match as you go along. You don’t get bored because there are eight exercises and each one is only performed for 30 seconds. Every day the exercises are different, and the instructors are switched out so you don’t get tired of looking at the same people. A music tract accompanies the exercises which you can turn off if you want. You don’t need weights or any special equipment. There are a couple of floor exercises where a mat might come in handy, or you could just exercise on carpet. You don’t need a timer to take your pulse as the instructor keeps track of the time. This is a great value for everything you get. The DVDs alone are worth at least $10 apiece. Each one has 72 minutes of exercise, 432 minutes total. Plus there’s a bonus DVD with additional exercises for abs, hips, buns and thighs. There’s a 30-day money back guarantee. This was a big factor for me in deciding whether or not to give it a try. Kick Start Your Fat Loss in Just 6 Days. A six-day quick start nutrition plan. This is a very strict plan. Two of the days only allow leafy green vegetables and water. 7 Steps to High Speed Fat Loss. An explanation why conventional diets don’t work and why we should eat an ancestral diet. On the Go Nutrition Glycemic Index Pocket Guide. A handy guide for when you’re eating out. PACE Express Calipers. A more accurate way of measuring fat loss. PACE Express workouts are suitable for everyone: men and women, young and old. You’ll notice your heart and muscles getting stronger. As time goes on, you can progressively increase the intensity of your workouts so that you never plateau or get bored. You can look forward to more flexibility, better balance, improved endurance and the satisfaction of keeping a commitment to yourself. 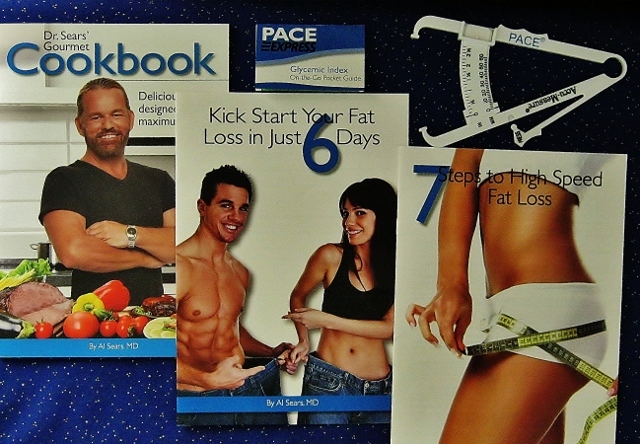 Visit PaceExpress.com to read the success stories, get more information on exercising 12 minutes a day and to order the PACE Express DVDs. https://lyndamakara.com/wp-content/uploads/2012/09/pace-express.jpg 437 650 [email protected] http://lyndamakara.com/wp-content/uploads/2018/01/logo-2.png [email protected]2012-09-18 01:24:042015-02-02 22:47:20How much do I have to exercise? Let me tell you a little secret: I don’t like to exercise. In fact, I’m lazy, okay? I want to do the bare minimum. Does that sound like you too? So when I learned I could get a total body workout in only 15 to 20 minutes, I thought, this is something I can do and will do. And I’ve been doing it now for over two years. I’m talking about kettlebells. Kettle what? Surprisingly, most people still don’t seem to know about them, even though they’ve been gaining in popularity in recent years. It’s a round weight with a handle attached. They’ve been popular with Russian bodybuilders for many years but were only introduced to America around the year 2000. Many celebrities have talked about using kettlebells. These celebrities have been known to work out with kettlebells: Jennifer Lopez, Kim Cattrall, Penelope Cruz, Kim Basinger and Katherine Heigl. And that’s the key right there. It’s an efficient and effective workout because you train different body parts at the same time, and you really work up a sweat while doing it. I’m not saying you’re going to look like Katherine Heigl or JLo (hey, it’s a kettlebell, not a magic wand), but you will be the best version of YOU that you can be. I like the simplicity of it: not having to drive to a gym, not having large pieces of exercise equipment cluttering up my house, and having just one small kettlebell I can tuck away in my closet. I like feeling strong and having a body that’s flexible. I like knowing that my bones are being strengthened as well. The basic move in kettlebells is the swing. It looks deceptively easy but you’ll be working up a sweat in no time. To do the swing, stand with your feet about 12 inches apart. Hold the kettlebell with both hands and swing between your legs, aiming for your hips (swinging too low will cause injury). As you’re swinging, bend your knees and push your hips back as if you were going to sit in a chair, then you pop your hips forward as you swing the kettlebell out in front of you while tightening your buns and abs. There is only one right way to do the swing. Doing it wrong will put you at risk for injury. Watch this short video by Iron Core trainers to see the right and wrong ways demonstrated. The sound quality isn’t great, but it’s still worthwhile. An interview of Sarah Lurie by Vanessa Valiente on the benefits of kettlebell workouts and how popular they are with celebrities. You will also see some moves in action. I use and recommend GoFit kettlebells and workout DVDs. Someone who has not been weight training should start out with a 10 pound weight. That’s the one I started with, then went to 15 pounds, and now I use a 20 pound weight. When you buy a GoFit kettlebell, it comes with an instructional DVD that only shows you how to do the different moves. You’ll also need to get a separate workout DVD. This four DVD set will take you from a beginner all the way to an advanced user. Find your motivation. Starting an exercise program is easy. Sticking with it is a lot harder. Think about what you want to accomplish and why. You should have both positive and negative motivations. For example, a negative motivation might be that you want to avoid getting osteoporosis like your mother. 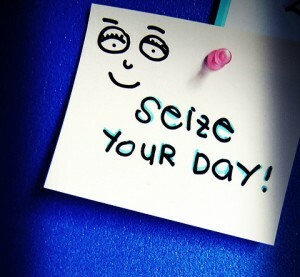 A positive motivation might be the good feeling you have wearing your skinny jeans. Make an exercise schedule. Decide how many days per week you are going to exercise and what routine you will be doing. Make a commitment to yourself. There will be times when you just don’t feel like exercising. We do lots of things we don’t feel like doing because they must be done. Not being in the mood is not a good enough reason to skip your exercise. When all else fails to motivate you, just do it because you promised yourself. Record your accomplishments. When I’m done with my workout I mark it on the calendar. Seeing my accomplishments in writing makes me feel good. I started off with three 15-minute workouts a week. Within a couple of weeks I was seeing great improvement and wanted to do more. That’s when I started working out with Sarah Lurie’s Iron Core kettlebell DVDs. I couldn’t even do all the reps at first but I would do as many as I could. Every day I was able to do more until it became quite easy and took less time. That’s when I would switch to a more advanced routine or get a heavier kettlebell. 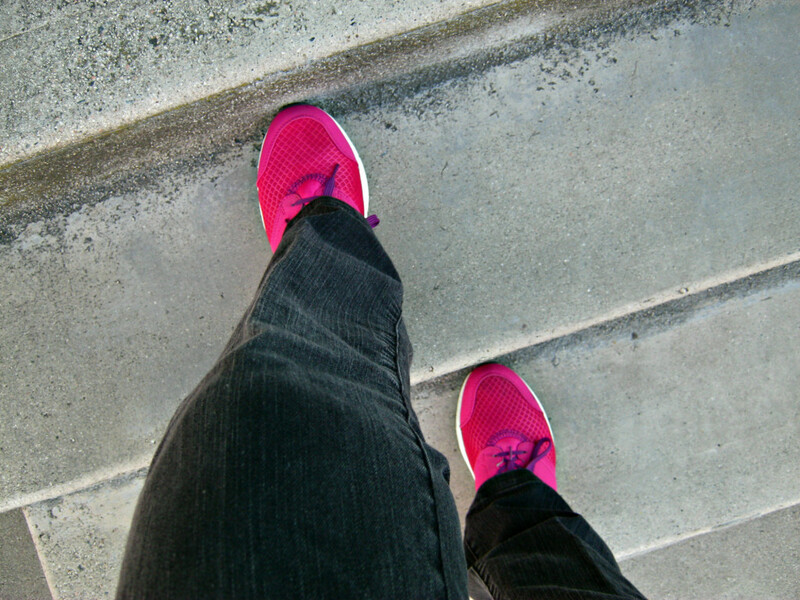 As a middle-aged woman, I felt like I needed to do a little exercise six days a week. Three days a week I would do the longer “strength training” workout and the other three days I would do more aerobic-type workouts of kettlebell swings or an 8-minute Tae Bo workout. Now after reaching my goals, I maintain my results with six 10-minute workouts per week. I do the Kettlebell Express workout, with a 20-pound weight, on Sunday, Wednesday and Friday. On Monday, Tuesday and Thursday I do kettlebell swings or an 8-minute Tae Bo workout. Saturday I rest. Update: I’m still exercising six days a week, but I’ve switched up my exercise routine a little bit. Now I only do one or two kettlebell workouts and the other days I do 12 minute PACE Express workouts. It took about nine months to get fit with kettlebell workouts and healthy eating. Yes, it was slow (that’s the tradeoff for being “lazy”) but consistent. This was the only thing that worked for me (a postmenopausal woman in my mid 50s), and it will work for you too.